Address: 8 Sofronij Vrachanski Str. 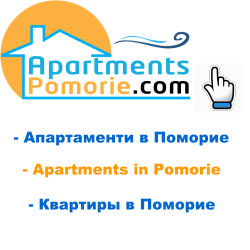 Additional information: Holiday Ahinora Apartment, Pomorie is a 3 star category. It is a maisonette type located on the 4th and 5th floor in a building located in the old part of the town in the old part of the town of Pomorie, 200m from the beach and the mud treatment sanatorium and in close proximity to the center of the city. We offer excellent conditions for relaxation and rest in a comfortable environment at any time of the year. It is possible to do procedures in the mud treatment sanatorium and to be our guests. Many shops and restaurants are within walking distance. The apartment is 92 sq.m. / max. 4 people). The first level includes a living room with a kitchenette, a small double bed, and two single beds, bathroom + WC, terrace with table, chairs and umbrella, cable TV, internet, air conditioner, equipped kitchen with built-in kitchen appliances - electric hob, fridge, washing machine, microwave, dining table, chairs, iron with ironing board. Second level includes: single bed, bathroom + WC, terrace. Prices per night of the apartment: June and September - 30 euro, July and august - 38 euro. We were unable to find the requested address (Pomorie, 8 Sofronij Vrachanski Str.) via Google street view due to Google street view doesn't have data for this address.